Last year, I came here to ask some questions about how to begin procedural content generation. And today, I am glad to telle you that I've come a long way and put together a really nice plugin for Tier 1: a Wave Function Collapse algorithm in Tier 1 ! In the beginning, I implented the algorithm in pure Tier 1 but I found that it was way too slow to be useable, and I wanted to use it to make, for example, dungeons for procedurally generated levels so it was not possible to have it in full Tier 1. Instead, I programmed a little plugin to speed up the generation process and I'm quite proud of the result ! The overlapping method generates a png file that is locally similar to the input while the tilemap method generates a tilemap using tiles and tiles' constraints. If you want to try it out before buying, you can use the attached DEMO with a documentation. It only includes the overlapping algorithm though and can't be used for commercial projects. I've put together a little working demo (Windows 64 bits) for you ! Just launch the file "WFC.exe" and enjoy. Watch out: The generation process can be very long and depends on your CPU. On my computer, this program takes about 1.5Gb~2Gb of ram ! It is a demo of the overlaping function (it can be used to generate worlds, images, textures, ...), the tilemap method is far more appropriated to generate game levels but I still need to do some extensive testing before putting together a demo. Quote: "In the beginning, I implented the algorithm in pure Tier 1 but I found that it was way too slow to be useable,"
What exactly made it too slow? The reading from an image? I did notice that looping through an array list that is looping through a map list with X and Y can get slow very quickly, but as long as you don't do that it can be very fast I think. Quote: "What exactly made it too slow? " It was mainly the generation part, I had to loop through the hole output memblock several times. 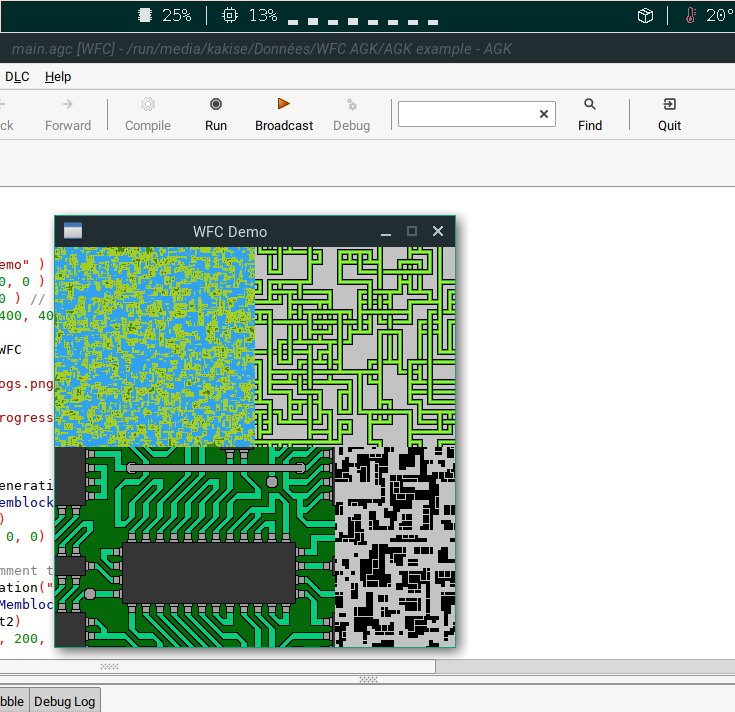 I still have some work to finish the tile methode, I need to find a way to implement some easy to way to define tiles and tilemaps in tier 1 and pass them to the C++ plugin. I have yet to add all tile types I have for my game though. I have implemented a fully working Tiling Generation method. To be honest, because we can't use custom data types with plugins, I kinda had troubles to figure how to do it so I ended up inspiring myself on already existing method because I think the way they implement tilemaps is easy to understand. I am more and more thinking about packing it together with a pdf documentation and selling it on the tgc store. What do you think about it? Haha you posted while I was writing @PHeMoX ! Yeah true, of course taking out any 'sync()' makes it pretty much instant, but the more complicated the loops, the slower it is for sure. I don't use loops within loops though, that would really slow things down too much. Aaaaand here's what is probably my last tech demo haha. As you can see on the screenshot, it literally takes one line to have this result ! By the way the dll is 0.5mb so it doesn't take that much space. That looks very impressive! nice job! I attached a demo version, on the first post, of the plugin with the overlapping function and I submitted it to the store, it is fully working and comes with a documentation on how to use it. If anyone wants to try it by himself, you can now ! Update: I uploaded my plugin to the tgcstore, with a full demo and an example, it is really straightforward to use: here's the link : https://www.tgcstore.net/product/32303 enjoy ! That looks impressive. Nice work! Could maybe be used in my mapper for pixelstein to speed things up? Plot out rough rooms i touch up? Yeah that could work ! By the way, I've also updated the plugin, it is now faster than ever aaaand avaliable on Linux ! i will try it as soon as everything calms down for me ..
any idea whats not working ? @Resourceful You can't use 64 bits with the demo, that's normal and explains why you have an infinite loading screen. Make sure you have put the WFC_DEMO folder in its entirety in the Tier 1/Compiler/Plugins folder of your editor.